What are the negative effects of economic segregation? How is economic segregation measured? Is economic segregation increasing or decreasing? How is economic segregation related to income inequality? Can we measure the balance of incomes in particular neighborhoods? How is economic segregation related to racial segregation? What about the modifiable areal unit problem? MAUP? Where can I learn more about economic segregation? What are the effects of the increase of inequality, economic segregation, and concentrated poverty? The Effects of Growing Inequality: The "Normalization" of Poverty? Where can I read more about Gentrification, Integration, and Concentrated Poverty? Cities have traditionally been places where people could realize economic opportunity—developing skills, finding jobs, and starting new businesses. Today, growing inequality nationally plays out in cities, clouding prospects for advancement. We’re also learning that key characteristics of cities, including economic segregation, impedes economic mobility that has long been a city strength. To learn more about economic opportunity and its ties to concentrated poverty, read our comprehensive report here. Economic segregation is the physical separation of households according to income: Low income people are concentrated in some neighborhoods; higher income people are concentrated in other, different neighborhoods. Economic segregation is associated with a range of negative outcomes for poor families. As bad as it is to be poor, the effects of poverty are greater for poor families living in poor neighborhoods. Studies by Raj Chetty and his colleagues as part of the Equality of Opportunity Project have shown that there is a correlation between economic segregation and lower levels of intergenerational mobility: places with high levels of economic segregation have less inter-generational economic mobility. There are a variety of statistical techniques that have been developed to measure the extent of economic segregation within metropolitan areas. One of the most common is the dissimilarity index, which computes fraction of high income or low income households that would have to move to a different neighborhood within the metropolitan area in order for each neighborhood to have the same income composition as the overall metro area. Whether measured by the dissimilarity index or by entropy measures, there is strong evidence that the degree of economic segregation has increased in the United States over the past few decades. Economic segregation is shaped by a number of factors including income distribution and importantly, public policy, especially land use controls and zoning restrictions. In most communities in the United States, the number of places where one can build higher density, lower cost housing (smaller single family homes, and apartments) are strictly limited. Some suburban communities zone nearly all of their land for large-lot single family houses, effectively excluding lower income housing. Economic segregation is related to income inequality. The higher inequality in a region, the greater will be the fraction of a region’s population concentrated in the “tails” of the income distribution. In general, higher levels of inequality are associated with greater levels of economic segregation. But economic segregation is a spatial measure, while income inequality is not, so places with the same amount of income inequality can have differing levels of economic segregation. Traditional economic segregation measures compute the variation in incomes across different neighborhoods within a metropolitan area. It is also possible to measure the distribution of income within an individual neighborhood (census tract). Impresa has developed the “Mixed Income, Middle Income” measure (MIMI) for individual census tracts. Because some racial and ethnic groups have disproportionately lower incomes on average (African-Americans and Latinos), in many cases racial segregation is correlated with income segregation. There are many racially segregated, high poverty neighborhoods in US metro areas. One statistical problem that bedevils computations of segregation is the “modifiable areal unit problem” also called MAUP. The computation of many indices of segregation, including the dissimilarity index, is sensitive to the size and boundaries of the geographic areas used. The more units into which an area is sub-divided, the higher will be the calculated score on a dissimilarity index. For example, in the limiting case (one unit) the dissimilarity score for a metro area is zero: no households have to move to make the distribution of the (one) neighborhood the same as the distribution for the metro area as a whole. Finer divisions of metro areas produce systematically higher measured levels of dissimilarity. A problem arises when comparing metropolitan areas wildly different sized neighborhoods. The commonly used unit for neighborhoods is a census tract, which includes an average of about 4,000 persons. But the physical size of a census tract can vary from a few blocks (in the center of a dense city) to square miles (on the urban periphery). Brown University’s US 2010 data site has rankings of US metropolitan areas according to a range of economic segregation measures, including the proportion of poor families living in poor neighborhoods, the proportion of high income families living in hign income neighborhoods and different entropy indices. Sean Reardon and Kendra Bischoff explain the trends in economic segregation in the United States through 2010 in their paper Growth in the Residential Segregation of Families by Income, 1970-2009. There is no agreed upon definition of gentrification; Credit for coining the term gentrification is generally given to sociologist Ruth Glass, who used it in the 1960s to describe the transition of formerly working class neighborhoods in London into upper class enclaves (Hamnett, 2000). The classic example of gentrification is a dramatic change in the economic status of a neighborhood, which is transformed from a place of primarily low-income persons and often dominated by racial and ethnic minorities, to a middle or high-income neighborhood, often composed primarily of non-Hispanic whites. Concentrated poverty is a particular concern because all of the negative effects of poverty appear to be amplified in neighborhoods composed primarily of poor people. Poverty anywhere and in any amount is a problem; but concentrated poverty is often intractable and self-reinforcing. Concentrated poverty is associated with negative social effects (higher crime, worse mental and physical health), and lower economic prospects (both for current residents now and their children over their lifetimes). Concentrated poverty tends to be self-reinforcing: low-income communities have fewer fiscal resources (despite greater needs), producing low-quality public services. A lack of strong social networks undercuts the political efficacy of these citizens. There are a number of studies that review the extensive literature on the negative effects of concentrated poverty (Jargowsky & Swanstrom, 2009; Sard & Rice, 2014; Kneebone, Nadeau, & Berube, 2011). Addressing these issues has implications for increased human capital and national competitiveness, reduced inequality, and increased social mobility. In discussions of growing inequality most of our attention is directed to the growing wealth of the top 1 percent or top 0.1 percent of the income distribution. 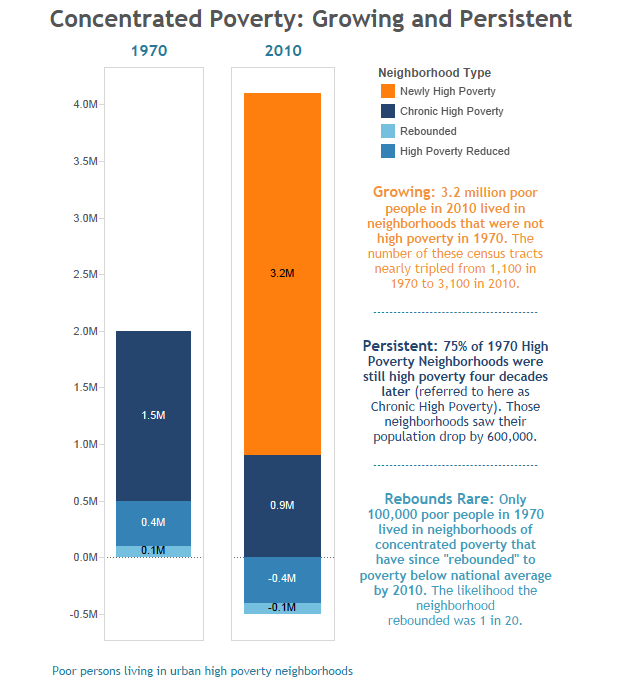 Our own report (found here) shows that the last 40 years have seen an increase in the number of very high poverty urban neighborhoods. This is in many ways the mirror image of the change occurring at the high end of the income distribution. The distribution below shows the poverty rate of both the number of census tracts and number of people living in those tracts. It is clear in both cases that the number of people and neighborhoods with a “normal,” or average, rate of poverty-15% or less- has decreased. More disconcerting is the tail end of the distribution. Neighborhoods with an 80% poverty rate or higher were almost non-existent in 1970. Today, over 72,000 people live in census tracts with a 80% or higher poverty rate. Gentrification and neighborhood changes are hotly contested subjects. In the past few years some very thoughtful and provocative work has been done that helps shed light on these issues, and we’ve compiled many of this work here and here.